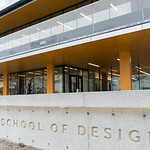 The new home of the Wilson School of Design is situated in the West Coast city of Richmond, British Columbia, 20 minutes by train from downtown Vancouver. Our recently opened (January 2018) 65,000 square foot campus includes innovative teaching studios and labs, a testing centre, gallery space and expanded study and design spaces for students. It also houses advanced technology, such as laser cutters, 3D printers and ultrasonic welders. Watch a time lapse video of the building’s development. 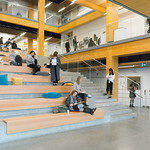 The school provides a collaborative space for a range of design programs including bachelor degrees in Product Design, Interior Design, Fashion Design & Technology, Graphic Design for Marketing, post-baccalaureate diploma in Technical Apparel Design, Fashion Marketing Diploma and Foundations in Design Certificate. The $36-million Wilson School of Design building was funded through a $12-million contribution from the B.C. government, $12 million from KPU and $12 million in donations that include $8 million from Chip and Shannon Wilson. Read more from The Ministry of Advance Education, Skills and Training news release. "Design careers are vital for a 21st-century diversified economy. The programs in the new building will create exciting choices for students, as well as support for local design industries." Melanie Mark, Minister of Advanced Education, Skills and Training. "Chip and I share a passion for nurturing creative talent, and we are thrilled to partner with KPU to help develop the next generation of designers and innovators."